The availability of grass or not will see the number of elephant births rise or drop, so culling is not necessary, says a large mammal ecologist. The largest terrestrial mammal, the African elephant, is its own worst enemy when it comes to habitat destruction. African elephants can weigh more than 6 000kg, live up to 70 years old and eat up to 450kg per day. Their size and intelligence gives these mega-herbivores their own level of stubbornness, but they almost always lose in conflicts with humans. Unfortunately, South African National Parks large mammal ecologist Dr Sam Ferreira says policy is influenced by people without a constitutional mandate, which puts elephant norms at odds with the practicalities on the ground. Therefore elephants were at risk when they become “nuisance” animals. 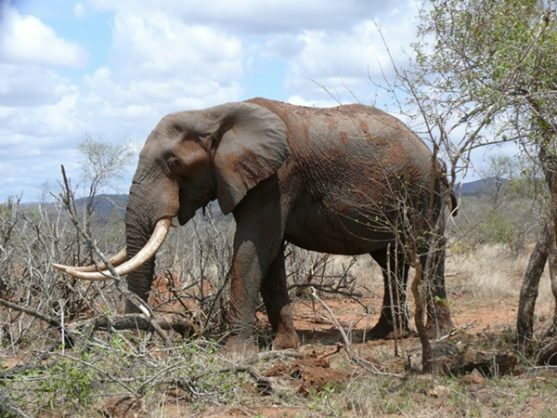 So how can African elephants’ behaviour be changed when conflict does happen? It’s simple: when there’s an estimated 19 000 of them spread over more than two million hectares, change their environment. It’s the real-life equivalent of “moving heaven and earth” and in the Kruger National Park (KNP), Ferreira and the rest of the scientific services team are tasked with implementing the elephant management plan. 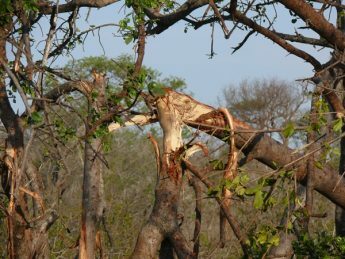 The many bare patches of the KNP with broken and debarked trees are testimony to the elephants’ predilection for succulent vegetation and the damage appears to be widespread. And yet, experts have concluded there is enough space and vegetation for nearly double the current population. 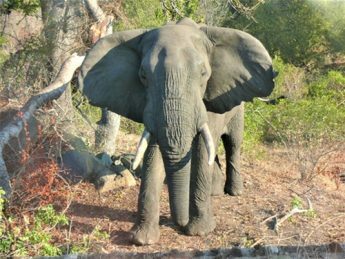 “A study predicted the Kruger region should have between 30 000 and 35 000 elephants, which is when the population would start oscillating,” Ferreira says. How elephants were managed began to change significantly about 15 years ago when it was realised that managing resources was easier than trying to manage the numbers. “When a study of all the papers on elephant impacts was released, it was found that elephants had no impact on trees,” Ferreira said. He noted that there was a time when roughly 80% of KNP was within five kilometres of permanent water supplies. This meant the animals were unaffected by wet or dry seasons and therefore didn’t have to move out of their comfort zone. So when the KNP began losing boreholes it was predicted that the elephants would move to the rivers, which they did. “The Olifants River now on average has less elephants within 2km of the river in the dry season compared to when we were culling. “Places like the Crocodile River have on average nearly double the number, due to sugar cane being there. “So they are using it less intensely in some places and more intensely in others and there’s a correlating impact on the trees. “This is what happens when the gradient of resources is restored,” adds the ecologist. It also meant that biodiversity was increased, and Ferreira now has control of the elephant herds. More than that, he has control of their population growth. Ferreira added that an elephant’s condition was determined by how much grass was available, and not trees. Factor in the severity of the drought from two years ago and he’s expecting a drop in births for 2018-19 as an elephant takes 22 months to gestate. Except, of course, it’s never that easy. Nearly 30 places where the landscape has been seriously damaged have been identified in the park and there is a 70% overlap with where people used to live. The cutting edge theory is to re-introduce the zones of increased vigilance for elephants around those areas identified as damaged. “If you know where the danger is, but you don’t know when it is coming or what form it takes, you’ll want to stay away from there and that’s the concept we’re busy with now,” he said. “There is no way there will be broad-scale culling like in the old days. Eventually, however, the aim was for the environment to be completely self-sustaining in terms of managing ecosystems, Ferreira concludes.